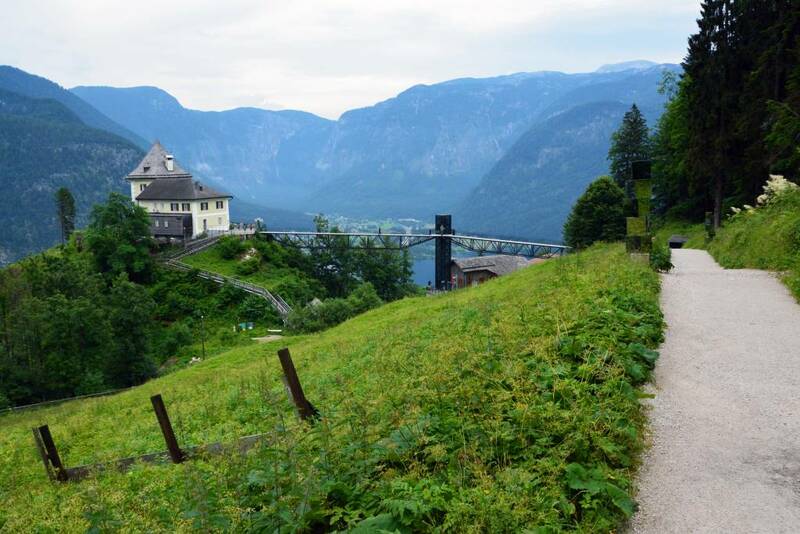 Following a fairly long hike from Bad Goisern to Hallstatt the day before and knowing that we would be facing an even longer hike throughout the course of the day, we started our hike from Hallstatt to Gosau with a shortcut! 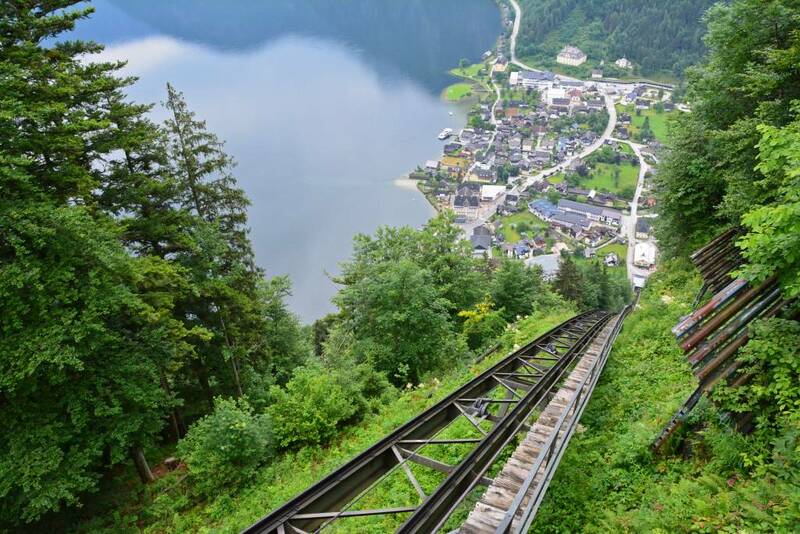 Using the discount provided by the Salzkammergut Card, we took a 3-minute ride on the salt mine funicular to the Hallstatt upper valley which sits at an altitude of 2,749 ft (838 m). 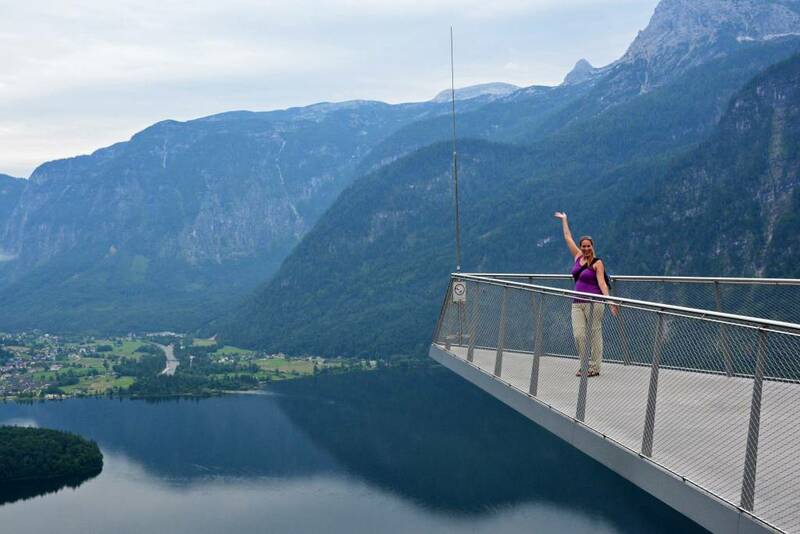 Once at the top, from the vertigo-inducing ‘sky-walk’ platform, we stood in awe of the panoramic views over the UNESCO World Heritage region of Hallstatt Dachstein Salzkammergut. 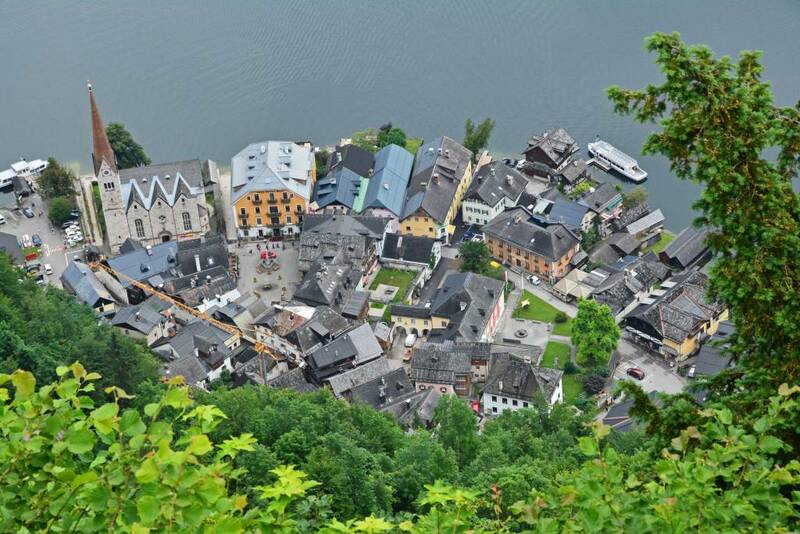 The town centre of Hallstatt appeared below like a miniature model of the already quaint village. Not wanting to get too late of a start on our long hike, we took a few pictures and started the steep ascent up the hill leading past the famous salt mines of Hallstatt. Already feeling ever-so-slightly fatigued from yesterday, the constant uphill right from the get-go was rough… but little did we know, that was just the beginning of a very long day of hiking! We had a trusty map marking our route and had a pretty good idea of what path(s) we needed to take throughout the day. Once we made it past the salt mine, we turned onto path 640, a logging road leading to the foot of Mount Plassen. Already panting, sweating, and maybe even after a little bit of swearing, we made it to our next fork in the journey. There was never a shortage of signs at each fork, giving us a moment of rest as we managed to figure out which direction we needed to head. Our next turn was a little less obvious with nothing more than a small pebbled path leading through a lush mountainside. 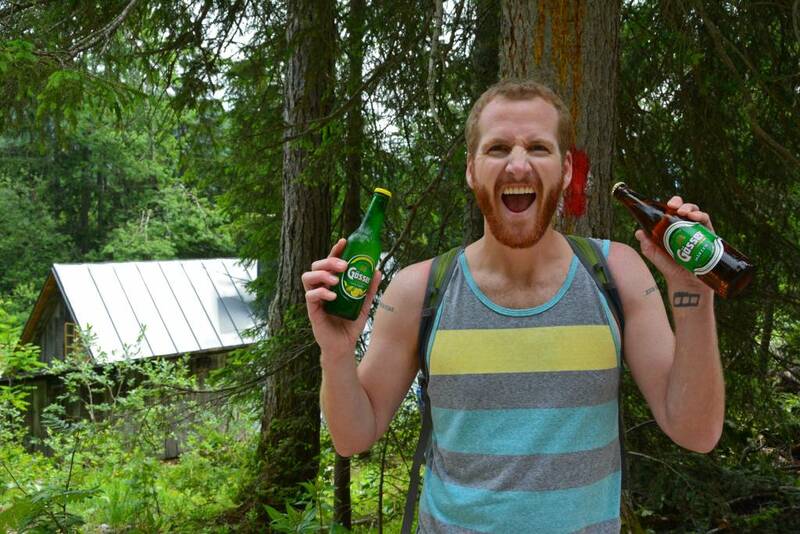 Sam had wanted to buy a beer or two for the hike, but we had no way of keeping them cool, so we decided to forego the brews and stick with the classic beverage choice of hikers everywhere- water! However, after about 2.5 hours into our grueling uphill ‘adventure’, we were rewarded with the most generous gift from an anonymous local. The hut was just like any other at first glance, with a mountain stream running through it. As we walked past, Sam caught a glimpse of a trail sign on the far side of the building, so he went to check it out. 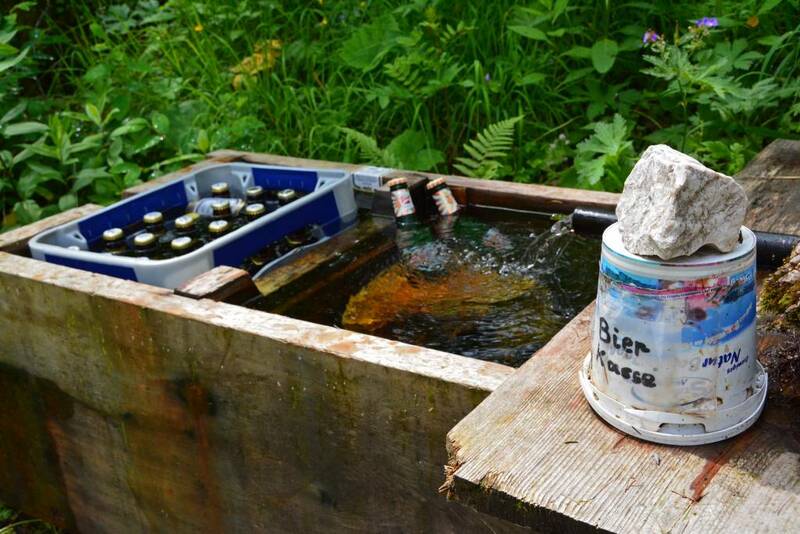 Lo and behold, there was a wooden trough filled with beers, chilled ice-cold by the fresh mountain stream water! 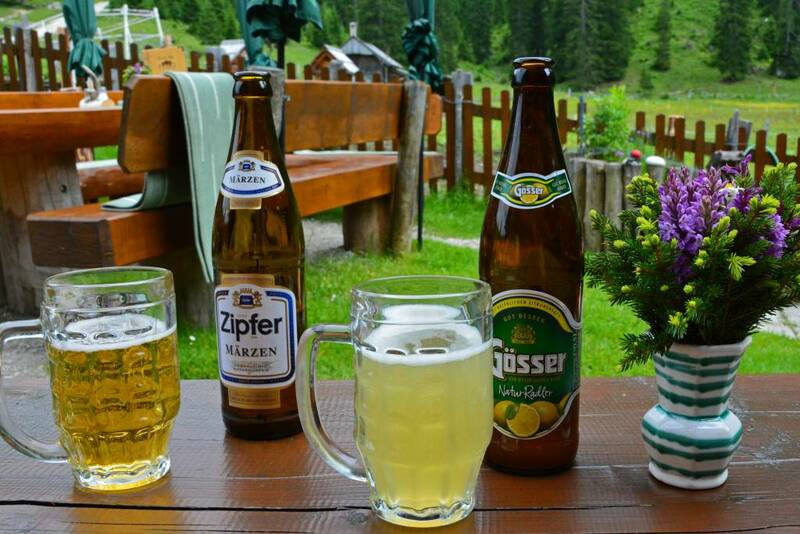 He was only too happy to drop a few coins into the money bucket so we could enjoy a well-earned beer and refreshing radler (beer/lemonade). 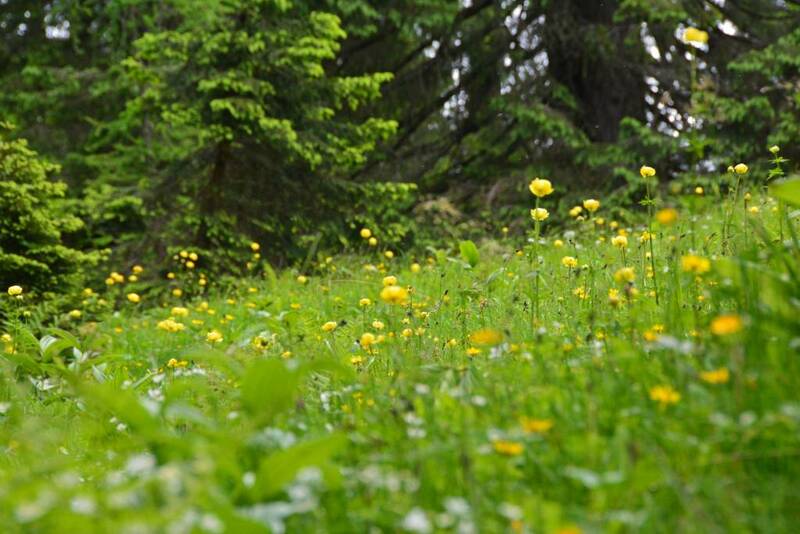 Feeling slightly refreshed and rejuvenated, next on the hiking itinerary: sludging through the swamp area known as Dammwiese meadow. Now, let me preface the rest of this write-up with the fact that we did NOT have the proper shoes with us. Being on the road for an entire year does not permit us to travel with every type of shoe needed for every type of adventure we may encounter. 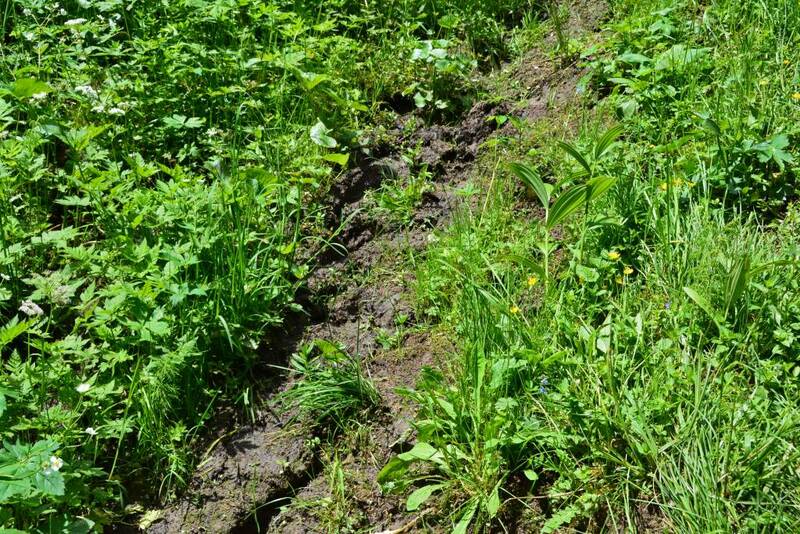 We figured that our hiking sandals would be sufficient for mountain trails, which they usually are, but not when there is mud involved… and on this trek, there was A LOT of mud! Though the path through the muddiest parts of the swamp area was covered with wooden planks and tree trunks, there were still heavily saturated parts of the trail that we had to carefully navigate to avoid sinking ankle deep into the sludge. This drastically reduced our speed and if only we had appropriate water-proof hiking boots, it wouldn’t have been much of an issue. Again, the views were great, but we were very quickly ready to be done with the slippery, slimy portion of the hike! Vouchers for a snack are provided as a part of the hiking holiday and we couldn’t wait to get to Rossalm for a tasty treat! Fortunately, we had stocked up with essential snacks and water, and with the surprise beer find, we weren’t starving quite yet… just ready for a resting place! 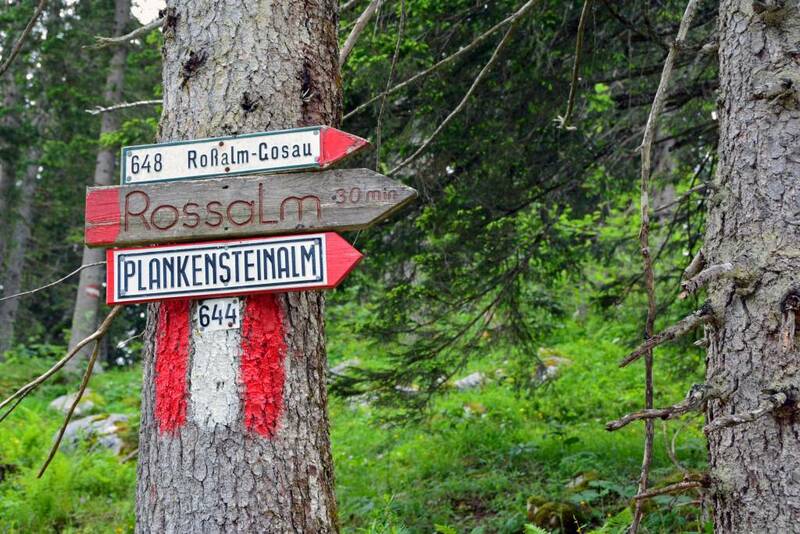 After spotting the ‘30 minutes to Rossalm‘ sign (above), we felt as if we gained a second wind, eager to get to our next destination… only to climb yet another steep hill to come upon a new sign stating that Rossalm was now 45 minutes away. WHAT?! Again, at least the views were nice! FINALLY starting what was probably the first downward descent after over 5 hours of hiking, we came upon a clearing and the first sign of civilization all day! 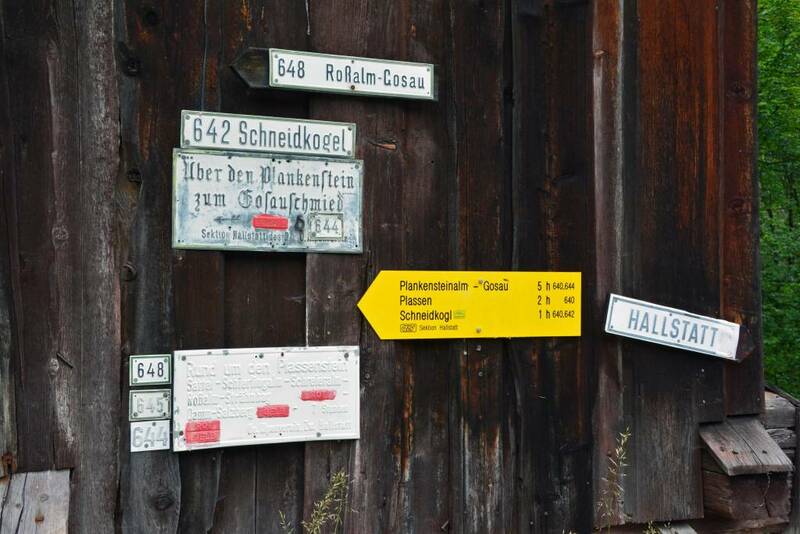 Mind you, by this point, we hadn’t seen another person since walking past the salt mine way back in Hallstatt. This beautiful country farm/home/restaurant was to us like a tropical oasis in the middle of a desert. 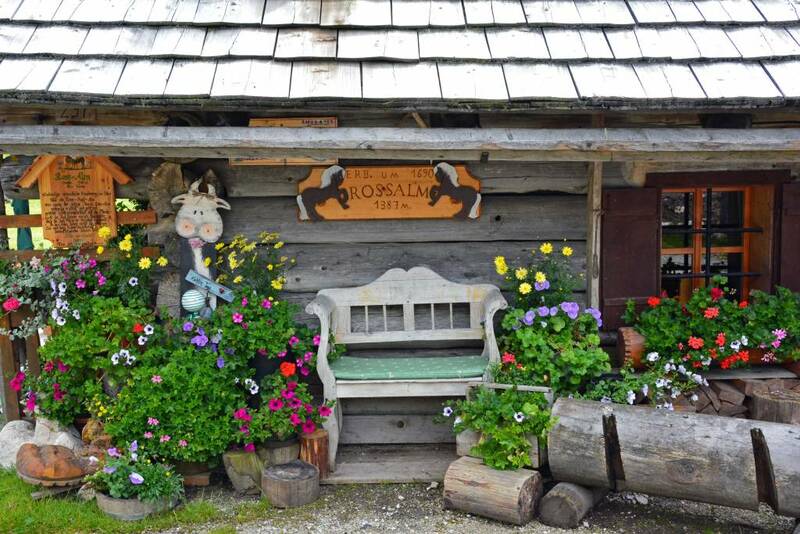 Ideally decorated with traditional Austrian mountain charm and surrounded by cows, goats, horses, chickens, and other farm animals, it was the perfect place to rest our aching feet. Finally somewhere to go to the bathroom, I figured it was also an appropriate time for another well-deserved refreshing radler (and a beer for Sam) to go along with our delicious snack! 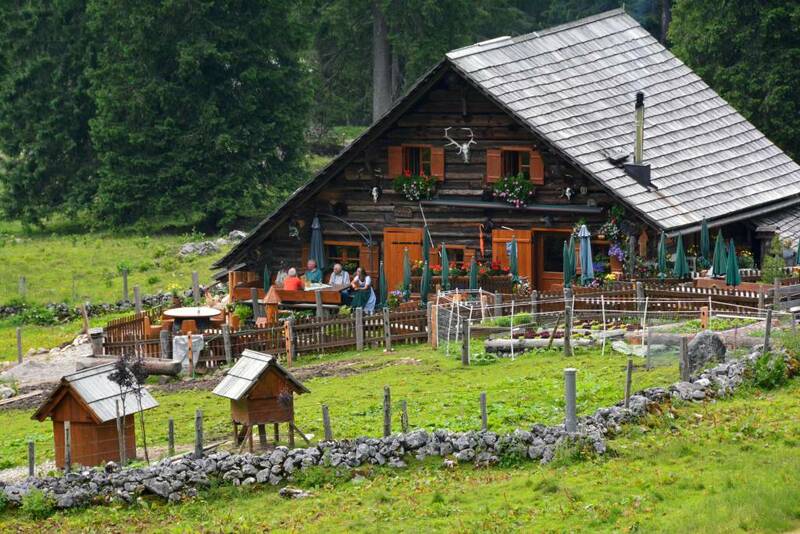 We inquired with the hospitable woman running the restaurant about the remaining journey to Gosau, anticipating that she would confirm our hopes for a continued downhill hike, only to be greeted with a look of pity and a hesitant response of, “kind of”. So we cautiously began what we thought would be an easier portion of the hike. Boy, were we in for a surprise! To a local, the signage may have made more sense, but we felt slightly confused by the wordage. Some signs said ‘Zentrum Gosau‘, others said ‘Gosau Vordertal‘. Were these different towns? Regions within Gosau? We couldn’t really tell looking at the map. 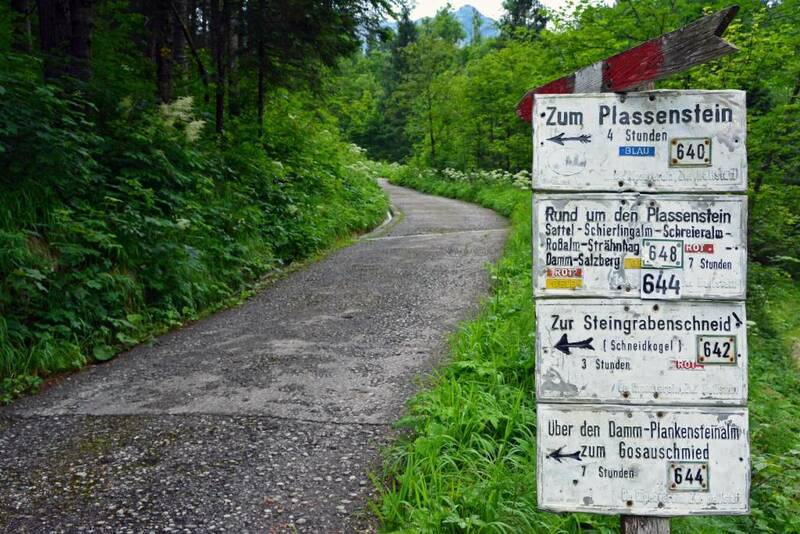 We’d think we were on the right track, then feel completely turned around as signs would point us into a thick forest where the only signage was an Austrian flag painted on a tree every so often. 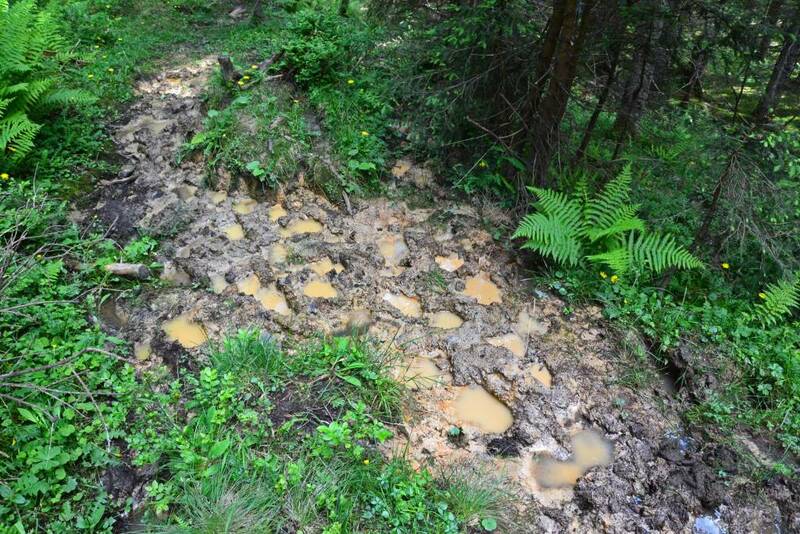 Not only were we uncertain of our direction, but we came upon more mud… thicker and tougher to navigate than before. I was starting to lose my cool at this point; I was ready to be done with the hike. After navigating one treacherous forest, we finally came to a road which, according to the map, looked like we’d follow it all the way down to Gosau. 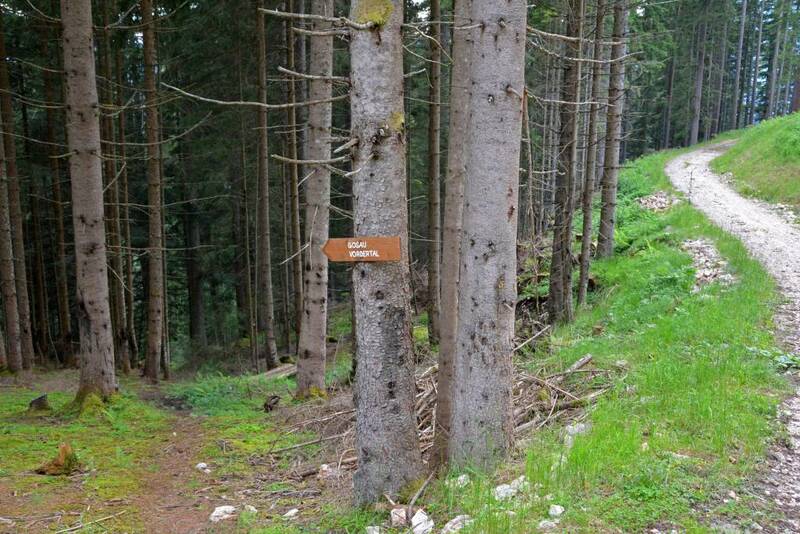 That was until we saw another sign… pointing us into yet another forest, but this path just didn’t feel right. For one, there were trees cut down everywhere and after seeing 3 or so red and white markers on the trees, they seemed to vanish. Running out of steam… and patience, we figured even if it took us completely out of the way, we’d just follow the road until we could figure out for sure where we were. So we continued on the road, but it started to feel as if it was going in the complete opposite direction of where we wanted to go. 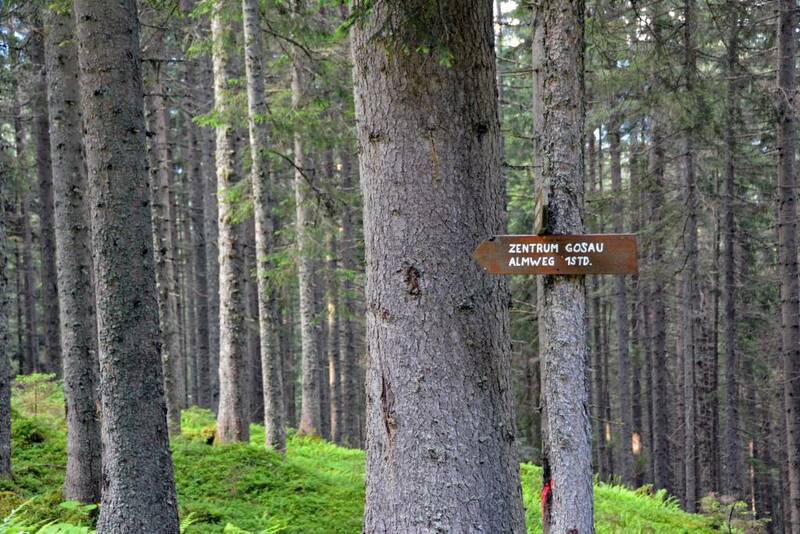 And so it was, we came upon one last sign with the word ‘Gosau‘ leading us into yet another dense forest, but this time seemingly in the right direction. 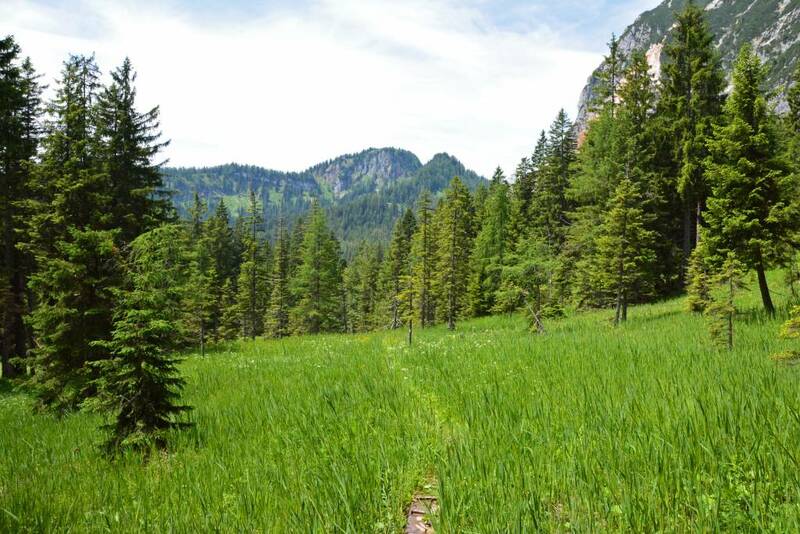 As I write this, I’m still not sure if we made a wrong turn somewhere or if the path(s) we took at each fork were on par for the intended trek. And even though it felt like we were headed in the right direction, it was on this final leg of our journey where I lost my composure. I was exhausted, emotionally and physically. This was harder than any other hike I’ve done in my entire life. My legs were shaking, my feet felt swollen, and though we were going downhill at this point, it was a steep downhill and yup, you guessed it… there was more mud. We both slipped a few times, making each step nerve-wracking. Add to that the fact that the advertised 5-6 hour hike turned into closer to 12 hours for us, and we were running out of daylight. 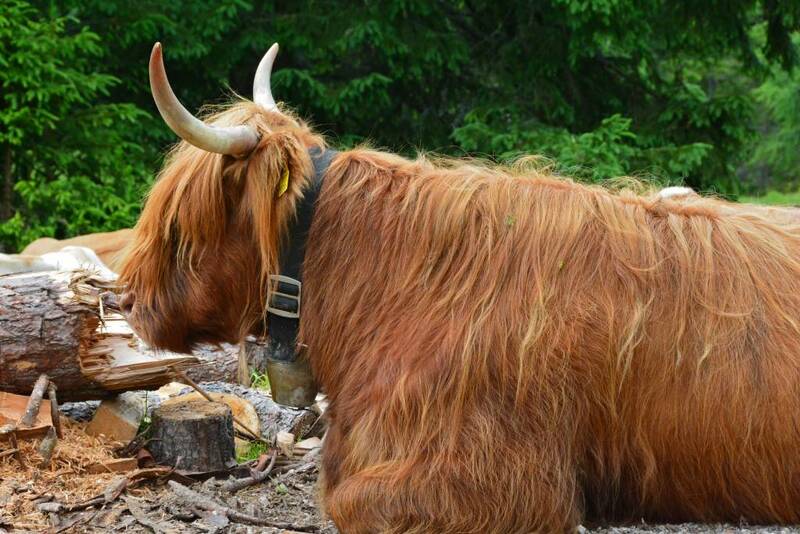 I put my camera away for the remaining duration and focused on only one thing… getting the hell out of that forest! After what felt like an eternity, we came upon the most glorious sight imaginable: GOSAU!!! We made it just in time for a beautiful sunset. Not that I felt like our timing was impeccable; I would’ve loved to arrive hours before then, but it was a stunning and welcomed sight nonetheless! Obviously this hike would have been much more manageable with the appropriate footwear. We would have forged on ahead through the mud, instead of tiptoeing around it at a snail’s pace. 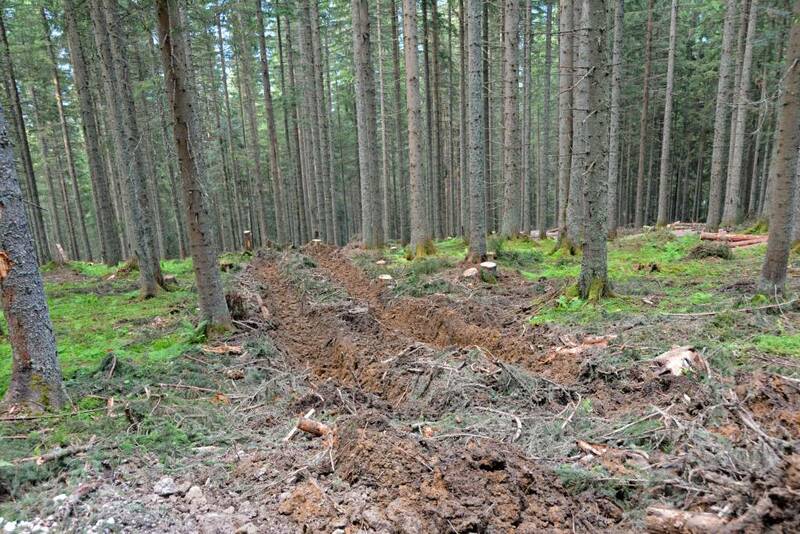 But, even then we would have considered the condition of the trails a little too messy for our liking. Yes there was mentioned of walking through a ‘swamp area’, but we naively didn’t think we’d be walking IN the marsh. We’re not sure if the amount of mud we experienced was the norm or if there had been an unusual amount of rain in the days/weeks leading up to our hike. Sam and I both grew up in Florida where everything was completely flat, and while we did a fair amount of hiking during the past few years in California, I wouldn’t say that we were quite prepared for the elevation gains we experienced in Austria. 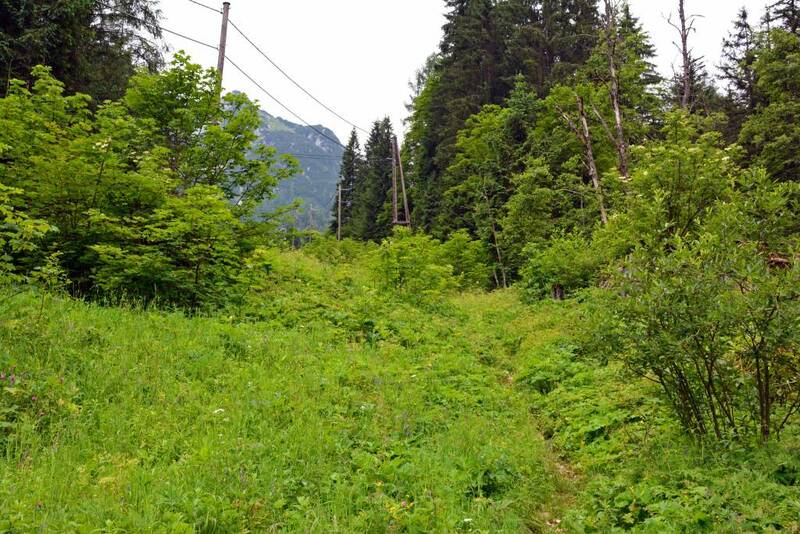 For a local, this hike may have been a piece of cake, but this wasn’t exactly a beginner’s ‘Introduction to the Alps’ route! 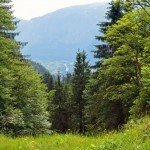 We talked with a few friends of ours who live in Europe following our hiking adventure who said that trails are rated quite differently in this region of the world. 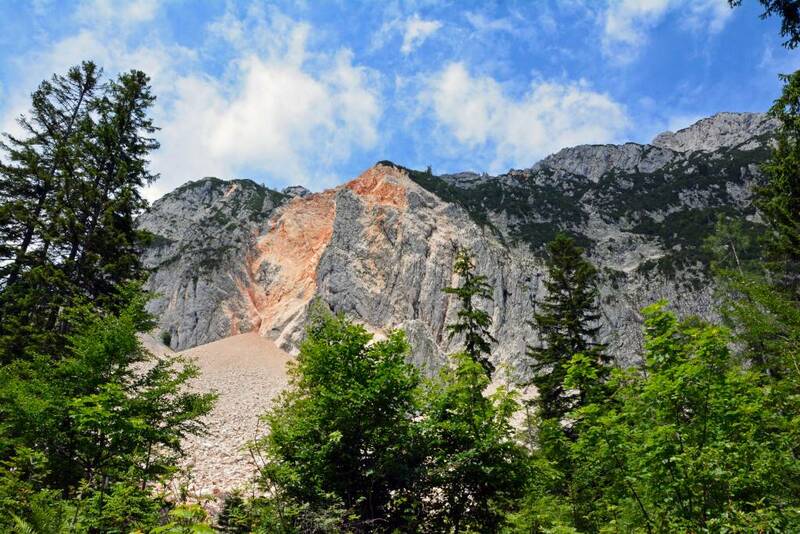 A hike may be rated by locals as ‘easy’ or ‘family friendly’, but in reality it’s extremely strenuous and you feel like you’re scaling Everest. 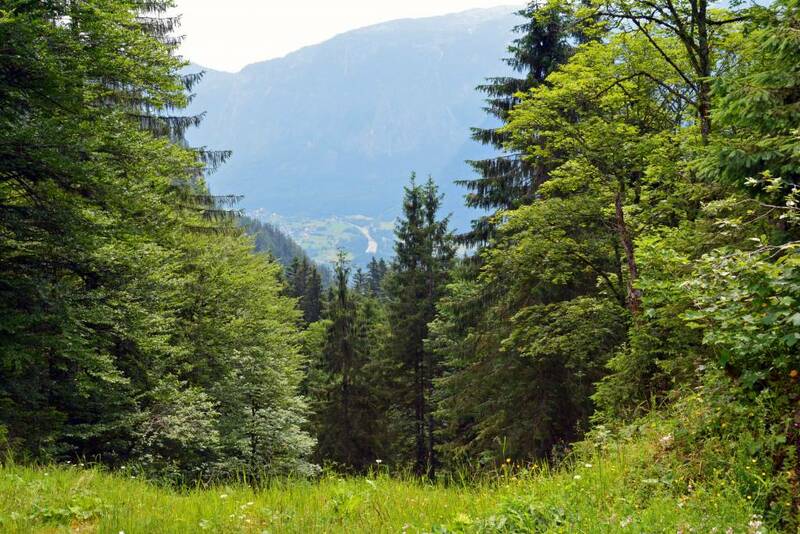 Consider your physical condition and stamina before embarking on such an Alpine adventure. Finally, we’ll embarrassing admit that we may have had a little bit of trouble at times finding the corresponding trail to go with the perceived route outlined on the map. Again, to a local, this may not have been such a difficult task, but with so many options and signs with varying names for the same location, well… we got confused. 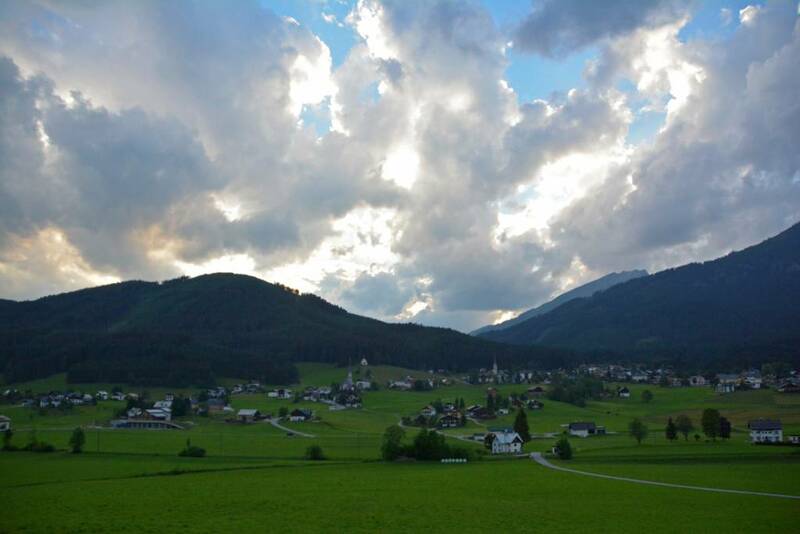 This experience in no way shape or form changes how we feel about Austria. 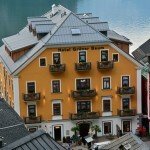 It is still one of our favorite countries and we’d recommend for you to visit in a heartbeat, particularly the absolutely stunning Salzkammergut region. 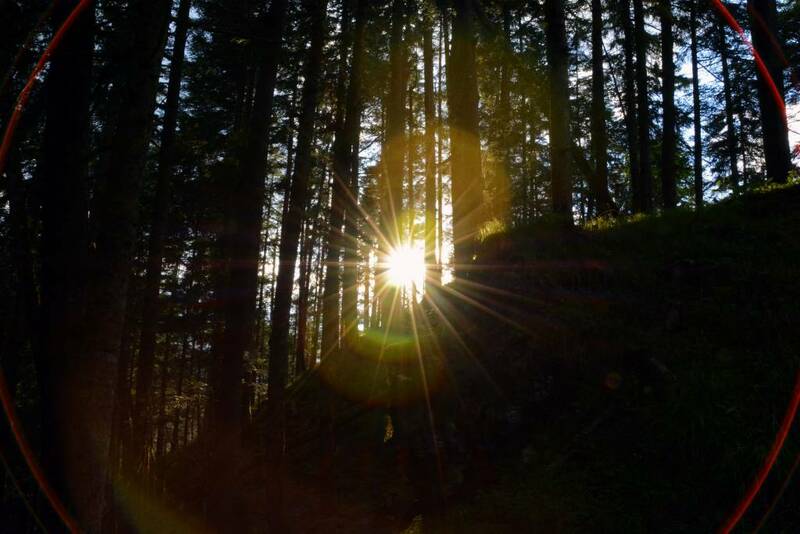 We’d even recommend hiking in Austria, so long as you feel that you are physically fit for the demanding trails. 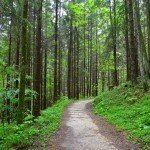 And we’d further recommend that you do your research to ensure the condition of the particular trail(s) you are considering. 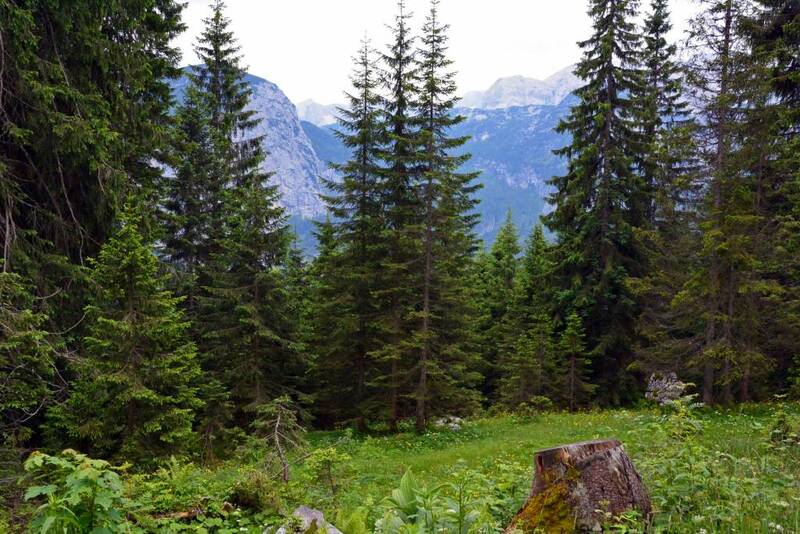 So while this wasn’t exactly the ‘adventure’ we were hoping for, it tested our endurance while providing us with some of the most amazing scenery the beautiful country of Austria has to offer!